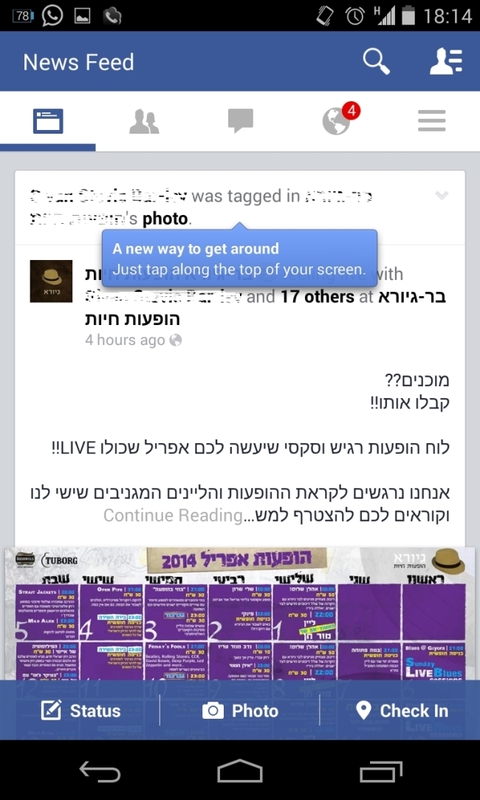 The newest beta version of Facebook’s flagship application for Android may look familiar -- to iOS users. The newest beta version of Facebook’s flagship application for Android may look familiar — to iOS users. 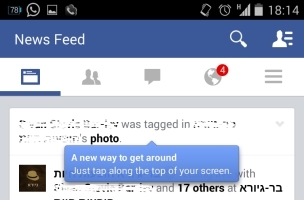 Blink Vice President of Planning and Media Eti Suruzon shared the screenshot above, in which the design of Facebook’s Android app more closely resembles that of the iOS app, and the iOS feature of tapping the top of the screen to navigate has been added. One major difference remains: The Android navigation menu is the opposite of that for iOS. In Facebook’s iOS app, the tabs for News Feed, messages, and notifications are at the bottom, while status, photo, and check-in are at the top. Android users: What do you think of this beta version of the app?